The one stop vehicle repair shop in Tamworth. 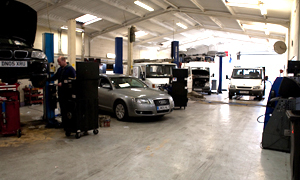 Whether you own a single car or a fleet of trucks, we can provide a tailor made service to look after your vehicles. Our fully trained staff can offer you a complete package of vehicle repairs from our 1.5 acre site, with modern facilities and the latest technology. Click here to read more about our services and see what we have to offer.